Standing beneath the surprisingly low ceiling of the upper level, we waited with baited breath as to what would happen next. Looking around at everyone else it was clear that a real element of fear did exist amongst us at the moment. We knew we were well out of the way to be overheard talking quietly amongst ourselves, or moving about, but we had all remained silent and motionless since heading up the stairs. We could hear the sound of voices grow louder and louder as they drew closer, each of us hoping that they didn't come up to the top. Looking around though at the top layer though, it was hard to see what they would come up here for... There was certainly no way to get into this place from here, and there was nothing to guard, so I doubted they would venture up here. The voices were now loud enough now to hear individual conversation, and it seemed to be that of the three groups heading out. As expected, the voices began to grow quieter, presumably as they began to head out into the Nether. "What did you hear exactly? Are they going anywhere...?" I whispered to COLUS everything I had heard; there were about sixteen guards, splitting into four teams. Three teams would head out into the Nether; two to guard this place and one to search for our camp. The last team would remain here with the leader and guard the inside. "So three teams are heading out now...? That would leave five here, if we include the leader. I think we can take that on..."
"True, but how do we get back out...? 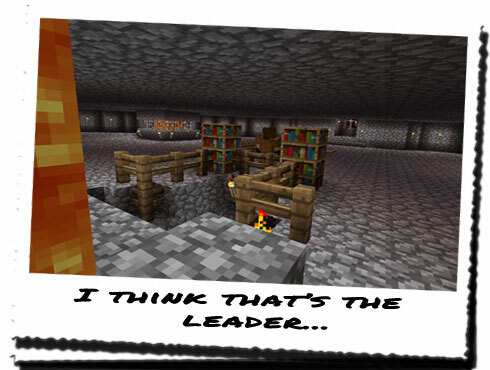 It's all well and good heading back down and taking the information we need, but how do we escape if there are two teams roaming the Nether around this place...?" "Simple: one of us stays here and watches the two teams' routes. The rest of us will dispose of the other team and get the information we need. We can only hope that it doesn't take too long to find the information we need." Amie pointed out that the information we were looking for was most likely going to be kept in that area that looks like a library or archive. It was definitely the best place to start. "Are we agreed then? One of us remains here whilst the rest go on a search for the data. Once we have it, we'll return up here and hopefully we'll have a good idea of how their routes operate. Who's going to remain up here though...?" THEXIS volunteered to remain on the top level, and we were about to go over the final plan when we heard voices outside. Creeping over to the far edge facing the path back to the Nether rock, we looked over the edge to see one team already heading out into the Nether. 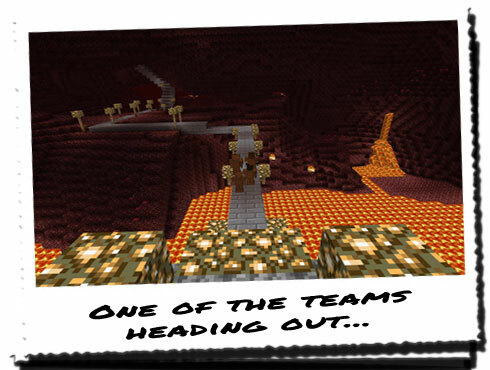 We watched as the team headed over the path and out into the Nether, quickly followed by the two other teams. As predicted, two remained close by whilst the other went way off into the distance, possibly towards the steps that we had used to reach this place. "Right, it's now or never! We'll be as quick as possible. THEXIS, make sure you watch those teams like a hawk! We need to know their exact movements when we're done!" THEXIS nodded and we all headed slowly down the stairs towards the first floor. We had to assume that the guards could be anywhere at this point as we hadn't heard any more voices since the three teams had left. Either they were being very quiet, or they were on the bottom floor... Reaching the bottom of the steps though, I froze as I saw movement up ahead. 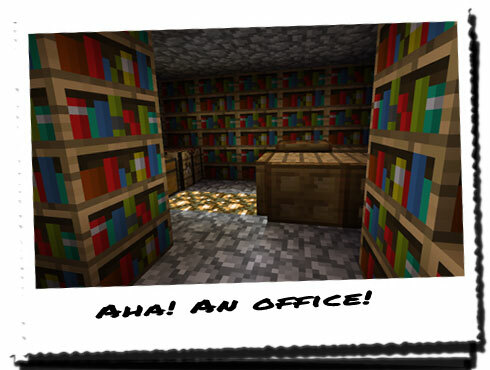 Within the gated confines of the cubicle at the front, one of the guards was looking through the desk before turning to the bookshelves, presumably searching for a file. Watching him intently, I realised that he was the guard who had been talking to the others some time ago. He must be the leader! I took out my blowpipe and loaded a dart into it, ready to knock him out, but before I could do anything, the guard dropped to the floor, slumped against the bookshelves. Looking across at the other staircase, and I saw THEROS waving back with his blowpipe. Giving the thumbs-up, we waited to see if there was any response from any of the other guards before continuing forward. We determined that the other four guards must be still on the bottom floor, and so we had to be quick about the next step. THEROS retrieved the dart from the leader's neck, and joined the rest of us. "According to Syeonyx there should only be four left. That's easily dealt with, and luckily we have two directions of attack. Half of us will descend the staircase behind the desk, whilst the other half descend the steps behind the central column. Try to deal with any guards you see quietly." We split off into two groups; I went with Amie and THEROS to the back of the central column and cautiously descended the stairs, looking out for any guards. There weren't any close to me, or anywhere nearby on my side, and I was beginning to wonder where they were, when I heard four sharp, high pitched whistles in quick succession. Looking around the stairs to the other side, I could now see four slumped unconscious forms lying on the floor, quite close to each other. Giving the all clear signal to the others, I joined COLUS and the others to plan out the next step. "We'll search the archive together to increase of our chances of finding what we need. Our top priority is a map of some kind that will lead us to the Eyes of Ender, with anything else being secondary to that. Any information that you find that could prove useful, put to one side."